Urdu is like French and Bengali – the sort of language in which a person might spew abuse yet sound like they are telling you they love you. This lyrical tongue with all its eccentricities and beauty is one of the pegs on which hangs the week’s big Bollywood release Happy Bhag Jayegi. The other peg is a Punjabi woman called Happy. Written and directed by Mudassar Aziz, Happy Bhag Jayegi is the story of Amritsari bride Happy (Diana Penty) who runs away on the day of her marriage ceremony. Even as the groom is readying himself for their mandap, Happy boards the wrong escape vehicle and ends up in Pakistan. While her husband-in-waiting Daman Singh Bagga (Jimmy Sheirgill) and her boyfriend Guddu (Ali Fazal) desperately search for her, she creates havoc in the lives of a budding politician in Lahore, Bilal Ahmed (Abhay Deol), and his fiancé Zoya played by the Pakistani actress Momal Sheikh making her Bollywood debut here. Most of this you might already have gathered from the trailer. What the trailer does not reveal is that the film’s best moments have been packed into it, and there is nothing much else it has to say. Happy Bhag Jayegi is hilarious at a superficial level and Penty is brimming with potential – as she was in her first film Cocktail in 2012 – but her Happy, despite being the titular protagonist, is the most under-written character in the entire story. So ultimately what we are left with is a film filled with laughter up to a point but completely lacking depth. Co-produced by Aanand L. Rai, the supremely successful director of Tanu Weds Manu and Tanu Weds Manu Returns, Happy Bhag Jayegi starts off very well. A runaway bride landing up in the home of a prominent politician in Lahore without her passport or visa is a situation teeming with possibilities. The first half moves at an accelerated pace, the humour is unrelenting and every single member of the cast is rock solid. Deol, in particular, gets a role worth his charisma after a long time and Piyush Mishra playing his ally, the hapless senior policeman ASP Usman Afridi, nudges the funny bone each time he walks on to the screen. Besides, how can you not giggle over a film featuring a grown Punjabi man called Winkle? And then something goes wrong. What happened in the pre-interval portion is repeated post interval, and it gradually becomes evident that Mudassar Aziz – who earlier made the disastrous Dulha Mil Gaya (2010) with Sushmita Sen – does not know how to take his concept forward. The film’s limited writing is its failing. Worst of all is the treatment of Happy. She seems like an interesting creature, a free spirit who will not be constrained by a despotic father, a violence-prone fiancé or misadventures in enemy territory. Yet beyond that one-line description, the film fails to acquaint us with this woman. She remains nothing more than the introductory note about her that was probably sent to the producer at the start of this project. Guddu tells Bilal that it is impossible not to love Happy once you get to know her, but we never get to know her so we do not find that out for ourselves. Imagine having your name in the name of the film, and yet being given only one calm conversation with another character throughout that film’s 126 minutes. Happy is constantly described with admiration and gazed at with adoring eyes by the two young men in her life, but we do not have a chance to fall in love with her ourselves because she remains such a distant figure. She is forever running in Happy Bhag Jayegi, but after a while the running too remains a gimmick that worked well in the promotional teaser but means little in a full-length story. Oddly enough, Bilal’s character is far better explored in the screenplay. In fact, at some point this becomes more a film about Bilal and Zoya than about Happy and Guddu. Perhaps a more appropriate title could have been Kya Bilal Happy Ke Saath Bhag Jayega? However, Aziz’s inadequacies show up here too. He is clearly keen to surprise us with Bilal’s actions and decisions towards the end of the second half, but since the man’s motivations are poorly fleshed out, they remain completely unconvincing. Bagga, on the other hand, is described as a vicious fellow by Happy. You can see that he ain’t no saint by the behaviour of the goons who form his coterie. However, his character never rises above Jimmy Sheirgill’s naturally likeable personality. For the record, though most of the story is set in Pakistan, the film is shot entirely in India – in Amritsar, Chandigarh and Mumbai. Aziz throws in some crowd-pleasing lines about Pakistan, but they are inoffensive and balanced out by the bond that forms between the four youngsters at the centre of the story. These are among the few moments of maturity in the screenplay. The others come in the atypical portrayal of the film’s Punjabis (they do not call out “Balle Balle” or dance the Bhangra at the drop of a hat) and in the writing of Zoya. She could have easily been pigeonholed as the evil doosri aurat (other woman) in the hero’s life, but somewhere along the way, a spot of nuance enters the picture and she becomes more than that lazy stereotype. One of the film’s nicest scenes is the one in which she urges Bilal to make his own life decisions rather than bowing to his father’s wishes at all times. Happy Bhag Jayegi includes the song Ashiq tera with the following lyrics (music – Sohail Sen, words – Aziz himself): “Dil ke aage yeh aafat badi hai / Khwahishein phir bhi zidd pe adi hain / Humse maayus hoga zamana / Par zamane ki kisko padi hai.” Roughly translated, that means: “There is a huge hurdle standing in the way of my desires / but I am determined to follow my heart / The world may be disappointed in me / But who cares about this world?” THIS is what the film should have been and could have been about. Happy Bhag Jayegi could have been about finding happiness in pursuing your dreams. You can see that that is what it wants to be, but does not know how to be. Aziz obviously has a flair for comedy but he needs to work on it. What he desperately needed here was either more time and thought, or a co-writer to help him build on the starting blocks he set up. 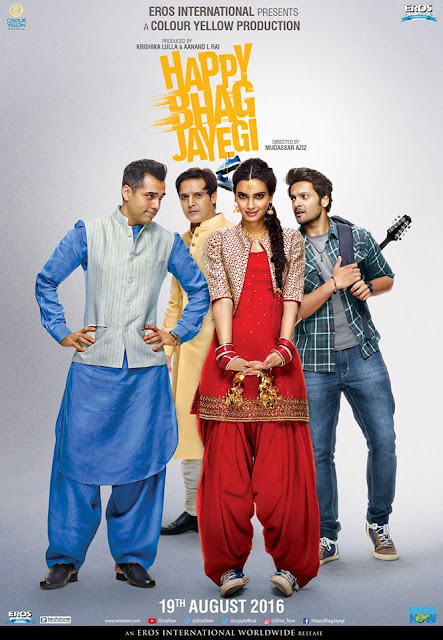 Happy Bhag Jayegi is fun and funny in large parts, but the second half is also bogged down by how insubstantial and consequently forgettable it is.